This is the first dance shoe that I've bought and my dance studio recommended me the Very Fines Shoe. I have been wearing it for my ballroom dance lesson and I am a beginner student. The shoe has a good grip with X-strap style straps provide a more secure fit. I've added a plastic heel protector to protect the heel and provides more traction. The only problem I encounter with this shoe is that there was several times that the upper quick release buckle came off while I was dancing. I guess maybe it was due to my skinny ankle, thus strap is a bit loose. The lower buckle fit perfectly. I am wearing a street shoe size 6.5 and I bought a size 5. So be sure to measure your shoe size correctly. In general, ballroom shoes should fit quite snugly and not allow the foot to move at all inside the shoe. The toes should come just to the end of the shoe or, in the case of open-toed shoes, actually hang slightly over the edge of the shoe. I am also glad that it came with a shoe bag and a show freshener. 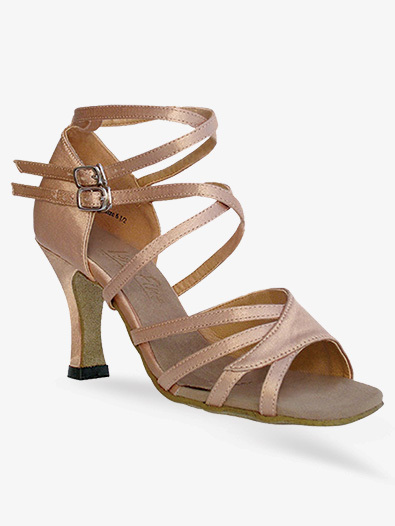 How do I secure the straps on my new ladies latin/rhythm strappy high heels. The strap slides into place, and the square buckle locks the strap into place with the clip. Please contact Customer Service if you have any questions.